Written and illustrated by various. The Graphic Classics series from Eureka Productions continues the long tradition in comics of attempting adaptations of classic literature -- dating back at least to the 1940s with the Classics Illustrated line (so famous the very name has become almost a term in itself), with other publishers dabbling with it from time to time over the years, such as Marvel, DC, Dark Horse and others. Of course, such enterprises can have mixed results -- even the phrase "classics illustrated" is sometimes used to denote adaptations that are a bit dry and workmanlike. What makes the Graphic Classics series somewhat unusual is that instead of adapting a single novel or work, these black & white TPBs feature an assortment of stories, adapted by different artists and writers, with each volume focusing on a particular author or, occasionally, on a theme (adventure, horror). Past volumes have been dedicated to Arthur Conan Doyle, H.P. Lovecraft, Mark Twain and others. With volume 13, though, even the creators acknowledge it's a bit of a departure, as Rafael Sabatini is probably more obscure these days. Which is an ironic reflection on the capriciousness of fame because, in his day, Sabatini was quite popular, with many of his swashbuckling novels being turned into then-hit motion pictures starring silver screen icons like Errol Flynn and Tyrone Power, including Captain Blood, The Sea Hawk, The Black Swan, and Scaramouche. This volume touches on that, with a lengthy (40 page) adaptation detailing the origin of Sabatini's pirate hero, Captain Blood, as well as pieces that are more crime-suspense stories, as well as ones dealing with then-voguish themes of the supernatural and mesmerism (though, regarding the former, Sabatini leans more towards secular solutions). Recognizing Sabatini's lower contemporary profile, they even include an illustrated biography of the man who was once labelled "the Prince of Storytellers". The result is a reasonably entertaining volume. Granted, some of the stories may've dated a bit, at least in sofar as I could anticipate the "twist" endings to some in advance...but they were still entertaining page turners. Of particular note, the brooding "The Mystery of the Valet", and the more easy going "The Spiritualist". As with another Graphic Classics volume I've read (Adventure Classics, which I'll either provide a link to when my review appears elsewhere, or simply post it at Pulp and Dagger at a later date), I'm not necessarily familiar with the original stories, so I can't be entirely sure if the spirit is being accurately reflected. For example, "The Fool's Love Story", is drawn in a cartoony style by Milton Knight, where the characters look a little like anthropomorphized animals out of an old Disney Comic, but the story itself seems as though it is trying for a more sobre tone. But I could be wrong. After all, care has been paid to reproducing some of the original text for the various stories, in captions and dialogue -- suggesting an attempt at faithfulness. Which itself is occasionally problematic, as the stories don't always feel as though they've been translated fully into comics. The art styles vary from the detailed stylings of Gerry Alanguilan to the cartoony, but reasonably effective, minimalism of Rich Tommaso on "The Dream". I was less enamoured of Jackie Smith's art on "The Risen Dead" nor, as mentioned, Knight's work. The most traditional, realist comic book artist -- and therefore, one of my favourites -- is Carlo Vergara. And fortunately he handles the collection's longest, and, in a sense, flagship story -- the Captain Blood saga. The Blood story is an effective, lush tale, even as, by modern standards, it's more suspense than swashbuckling adventure (the fights and running about are few). Although Sabatini's work is still occasionally in print, it's mainly his novels that continue to sit on the shelves. So, for fans of his, this adaptation of, presumably, more obscure short stories will doubtless be welcome. 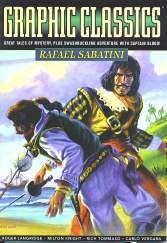 And for those who've never heard of him, this volume still offers a reasonable dose of entertaining tales, some straight suspense, some more whimsical and, in the case of Captain Blood, a good old historical adventure. Focusing on a less famous author as Sabatini might seem a risky marketing decision, but the advantage is that his work will be a little more novel. The problem -- conceivably -- with volumes adapting, say, H.P. Lovecraft is that, as his stuff is easier to track down, it might make a comicbook adaptation more redundant (as someone might prefer to just read the original, rather than an adaptation). I've enjoyed both this volume and Adventure Classics -- both more hits than misses. And based on that, one is inclined to suggest the Graphic Classics line, as a whole, is certainly worth a look.